Thanks to advantages compared to other roofing systems and favourable price, LOWO roofing system found many supporters very soon not only in the European countries but also in the USA and Africa. Thanks to heating of air and water by sunshine you can have a longer swimming season by up to 2 months without having to heat the water artificially. The macrolon boards used have heat-insulating properties similar to doubled glazing. 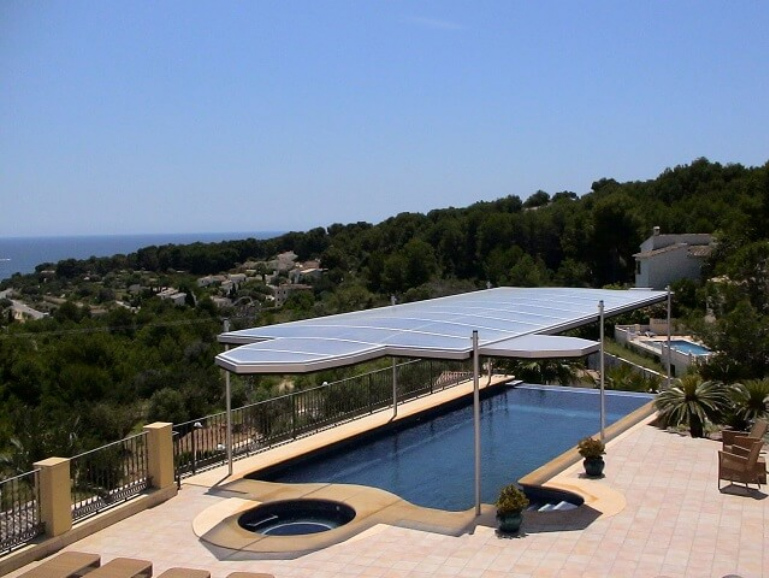 With 90% light permeability sunshine heats the water and the heat is accumulated in the pool and the water remains pleasantly warm. Under favourable climatic conditions no additional heater is needed. However, if you heat your water, LOWO will significantly reduce the heating costs. For everything working as should, we use first-quality materials and technologies: light structures, macrolon boards with great insulation properties, and patented string and lifting equipment which guarantees constant and noiseless operation. 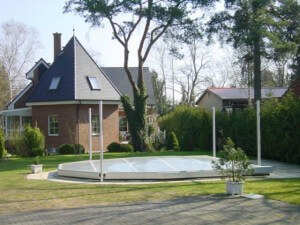 The LOWO Sonnenlift roofing system can be used for any shape of a sunken swimming pool. It does not matter if you have rectangular, oval or otherwise irregular swimming pool. 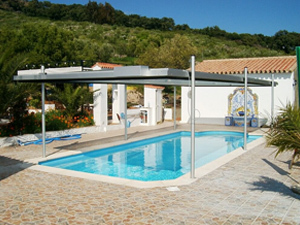 The elegant and handy roofing of the swimming pools is also very safe. Covered swimming pool prevents from fall of kids and animals in the water. 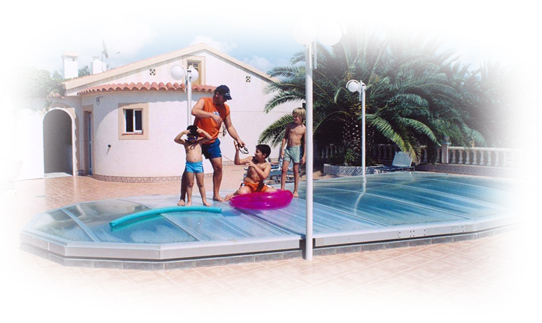 The loading capacity of the cover is 85 kg per square meter and therefore, there is no risk of collapse if you walk over the swimming pool or you drop something on it. Other potential hazards are secured by child-safety feature. While for opening you just press the button on the remote controller once only, you must press the same until the cover is closed when closing. The roofing of the swimming pool prevents from undesired leak of used water treatment chemicals. You can limit dosing and at least slightly protect environment and your budget. Hipped end roofing looks greatly in addition to great function features. 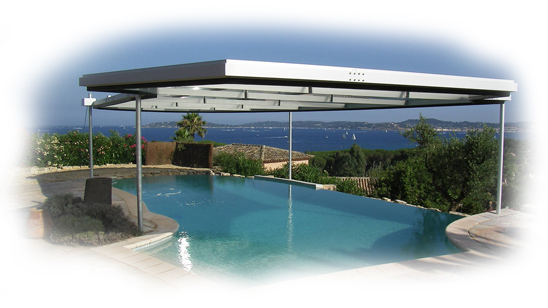 The LOWO roofing systems have interesting shapes that perfectly adapts to all shapes of the swimming pools. The covers have slight slope on sides and an arch in the centre. After single press of the remote control, the cover lifts up to 2.5 metres (2.0 metres in standard). As already mentioned the swimming pool can be easily covered and uncovered by single button press. 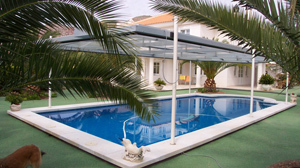 Compared to the other roofing systems, LOWO does not hinder you in any way after the swimming pool is opened. You can use full water area without any limitations. It does not block on the grass, there is no hazard you hurt from the cover, or step on it. no contamination enters the pool during thaw. You don’t have to clean snow immediately after falling. Bearing capacity of the structure is 90 kg/m2. Once again thank you very much for smooth and quick construction; everything works just fine. We have to deal with tile finish to okay everything. Water has 39°C, it’s great. We deliver goods to our customers in Germany, Austria, Italy, Spain and the USA. A satisfied customer is our goal and therefore, LOWO Sonnenlift customer service is available to all customers after purchase of the roofing system. We however believe that they will need the customer services very rarely. 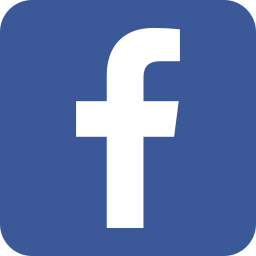 I have been using the roofing system for two seasons without any problem. Salt water, always warm and clear. The same is about the roofing. Great choice. It’s been a few years since you have done the roofing of the swimming pool. Everything works fine without any defects so far. Despite that I would like to ask you for a technical review of the system for continued safe function. Many children visit our pool for swimming and I’d like to have everything checked from experts.